Labor of Love Baby Boutique is surprising its customers this week with a gorgeous new collection of trendy bandana bibs for the modern baby. NEWMARKET NH, May 2, 2016 – On Friday Jessica Ekanem, owner and designer behind Labor of Love Baby Boutique, is unveiling the newest addition to its baby and toddler line of products. 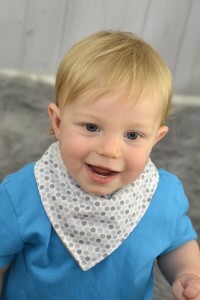 The new collection of trendy bibs offers a very modern take on a traditional bib, perfect for teething babies. The sophisticated design sits effortlessly around the baby’s neck like a scarf, keeping their clothes clean and dry. Jessica started Labor of Love Baby Boutique making cloth diapers. The shop quickly grew and she started offering other baby must haves like bibs, rattle toys, and soft soled shoes. After the birth of her second child, a little girl, she quickly jumped in and started offering clothing for all occasions from playdates to pageant wear and everything in-between. Families all across the United States, Canada, as far as Singapore and Australia, enjoy Jessica’s handmade garments and accessories.